It looked like this would be the week that the Toronto Raptors would finally get fully healthy. 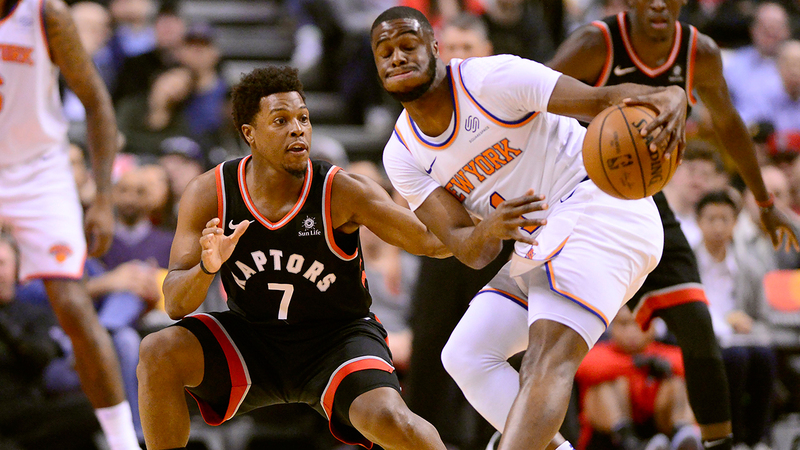 But after Kyle Lowry left a blow out win over the Knicks with an ankle injury, the team might have to wait a while longer before fielding a full lineup. Nurse says that come the playoffs he’ll aim to trim his rotation down to nine regulars. Assuming Lowry dodged a serious injury, he’ll join Leonard, Danny Green, Pascal Siakam, and one of Ibaka or Gasol in Toronto’s first unit. Playing with Ibaka or Gasol in the second unit will be VanVleet and OG Anunoby. So, there’s eight. Jeremy Lin, Norman Powell and Patrick McCaw will fight it out for the ninth spot, and as things currently stand, none of the above have separated themselves. With that in mind, games like Monday’s serve as somewhat of an audition for that trio. And perhaps the most interesting candidate to monitor is Lin. The 30-year-old’s first dozen games as a Raptor were certainly underwhelming, as he played to a minus-7.7 net rating while seeing more than 20 minutes of run per night. His true shooting, effective field goal, and assist percentages were all way down from his time in Atlanta earlier this season, and he’d finished on the right side of the plus/minus category in only half his games with his new team. An early adjustment period is to be expected from a player thrust into a new situation, but Lin’s struggles seemed to go beyond that. Nurse thinks part of the reason for it is that Lin’s been asked to step in as one of Toronto’s primary point guards in the wake of injuries to VanVleet and Lowry. It’s not easy to go from watching the symphony to serving as its conductor. Nurse tells a story from a recent game, when he drew up a play on the Raptors bench that called for Lin to handle the ball. As the Raptors took the court to execute, Lin asked his coach if he should take the shot if he was open coming off a particular action.